Be the first to share your favorite memory, photo or story of Kimbell. This memorial page is dedicated for family, friends and future generations to celebrate the life of their loved one. 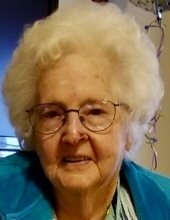 Kimbell L. Bertram Fannin age 100, New Castle resident passed away on Sunday January 20, 2019 at Glen Oaks Health Campus. She was born January 9, 1919 in Cartwright, Kentucky a daughter of Robert and Eva Gist Bertram. She had resided in Muncie for many years before moving to Henry County 30 years ago. She was retired from Ball Brothers Glass Company and Anchor Hocking Glass Company after many years of service. Mrs. Fannin was a member of of the Avondale Sympathy Club. She loved flowers and tending to her vegetable and flower garden until the age of 97. She was a member of the Glass Workers Union. Left to cherish her loving memory include her sister, Mary Sneed of Sulphur Springs and many nieces, nephews and cousins. She was preceded in death by her parents, Robert and Eva Gist Bertram; her husband of 66 years, Clyde B. Fannin who passed away in 2009; eight siblings: Zola Bertram, Woodrow Bertram, Earl Bertram, Jewell Brown, Maggie Clark, Edith Brown Deaton, Audrey Arnold and Marie Bertram. Family and friends may call from 12pm until 2 pm on Thursday January 24, 2019 at Macer Hall Funeral Home and Cremation Service. A celebration of life service will be held at 2 pm at Macer Hall Funeral Home and Cremation Service. Macer Hall funeral directors are honored to serve the family of Kimbell L. Bertram. To send flowers or a remembrance gift to the family of Kimbell L Bertram Fannin, please visit our Tribute Store. "Email Address" would like to share the life celebration of Kimbell L Bertram Fannin. Click on the "link" to go to share a favorite memory or leave a condolence message for the family.